Automotive Terminal Blocks are manufactured from copper, brass, nickle plated brass, stainless steel, steel, carbon steel, polyamide or any material composition as per custom specification. Automotive Terminal Blocks provide stable and durable connection in wide variety of applications. 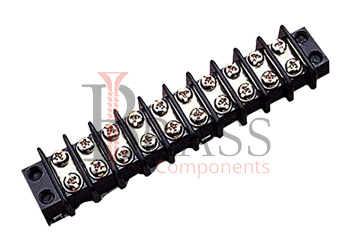 Auto Terminal Blocks are available with sturdy construction and longer functional life for providing superior performance to various automotive wire connectors and cable connectors. Available with barriers between the connection for additional protection. UL, cUL and CSA Rated. Compact, lightweight yet rugged for use in recreational vehicles, trucks, buses and marine applications. Available with recessed mounting holes. Provide durable and reliable performance. Eliminate twisting and breakage of stranded wire during connections. Available in Standard configurations or customized according to the customer needs. Widely used in Automotive, Automobile, Electrical, Transmission, Instrumentation, energy and other industries. Widely used for general purpose applications. Provide Reliable Signal Transmission solution for automation applications. Widely used in Automotive or Automobile wire connectors. We manufacture Automotive Terminal Blocks as per Custom Specification and export in Germany, Sweden, Denmark, Norway, Russia, France and other European Countries. For more Information, Please Contact Us or Inquiry Now.